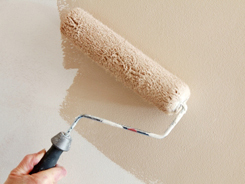 If you have a new drywall or wood surface that needs to be primed, you can tint the primer to match the finish coat. This will save you time on your painting project, and reduce the number of coats needed to finish. Prevent your paint rollers and brushes from drying out by wrapping them in plastic bags. This will keep them full of paint between coats and save you money on extra paint down the road. Let’s face it, we all just throw away our old paint rollers. If they’re too dirty to use, put it to good use. Using and extended handle, use it to clean the gutters on your house. Just slide it along the gutter to quickly remove any unwanted debris. Dinging your wall comes with the territory during any project. Just grab a wet cloth and your clothes iron and steam out the ding. It’ll then be ready to paint in no time. Click the link below for more DIY tips.